If you're visiting the park between now and April 1st, you might want to read the following. It seems very likely that Rita - Queen of Speed will be closed right up until the start of the 2006 open season. 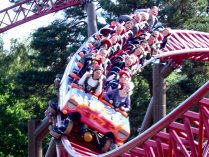 The ride was due to open between January and March for Winter Weekends but it emerged that a major component needed replacing. Initial estimates were that the work would be completed by the end of February, but now that time frame is looking a little too optimistic. The replacement part in question, the large drum that the winch cable wraps around, has not even been fabricated by Intamin yet. In the meantime, Spinball Whizzer will be brought in to replace Rita in the Winter Weekends line-up, which should ease relations between Alton Towers and unhappy guests expecting to ride Rita during their winter break.